In this silly send-up of the trend for makeovers, Beautiful Buehla primps Mr. Phibbs's zoo animals for their photo shoot. Despite Buehla's exhortations to apply the appropriate eye shadow, wear the hippest clothes, and do the right exercises, the animals are miserable trying to be something they're not. Chess's (The Costume Party) watercolors match the wacky tone of the effusive text, featuring a heroine who sports striped stockings and red high tops. Buehla is as enthusiastic as Richard Simmons and as convincing as an infomercial host, but the wide-eyed animals look suitably wretched. The lion hates his curled mane, the macho bears feel itchy in their disco outfits, and the gorilla wakes up to find his fur dyed pink. Like Buehla herself, Hoggs's (Stop That Eyeball!) extensive text seems overenthusiastic, but in the end, Buehla inadvertently undoes her do-overs. 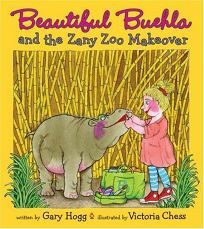 The denouement is both sudden and implausible: Buehla applies so much face powder that Large Marge, the flutter-eyed elephant, literally sneezes all the animals back to their natural state, whereupon they can finally offer genuine smiles for the camera. In case inattentive readers don't get the heavy-handed moral, a last page ""Safari Tattler"" faux news story editorializes: ""It is often the case that natural beauty supersedes the kind of packaging that our popular culture seems to expect."" Ages 4-7.